The gate installed by Worldwide Primates obstructs SW 180th St, a public road in Miami-Dade County. 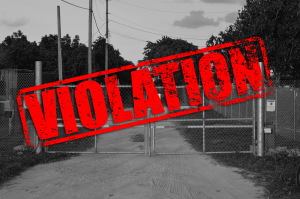 One of Florida’s most protested monkey farms is on the wrong side of code compliance. In 2013, we at Smash HLS announced our campaign to shut down Worldwide Primates (WWP), a Miami-based company that imports and breeds monkeys for use in laboratory experiments. Around that time, WWP did something very illegal. In an effort to amp up security, Worldwide Primates installed an electric gate on the road leading to its monkey breeding facility, creating a 150-foot buffer between the site and protesters. The problem? That road is public, and WWP never received permits for the gate’s construction. Three years later, thanks to a tip from us, WWP is finally being forced to tear down its illegal gate. The company was issued a warning last month and has until the end of this week to correct the issue. Stay tuned for more! How far will we be able to walk down that road? How much is public property?